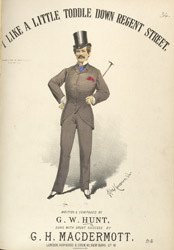 G. H.MacDermott, often billed as 'The Great MacDermott', was one of the leading music hall stars of the 1870s and 1880s. He specialised in the double entendre and sang topical songs. Regent Street was designed by John Nash and was completed by 1825. It was the centre of London's social and commercial activity and as its reputation grew, it became one of the most fashionable to be seen in. This song refers to the darker side of Regent Street -after dark street activity was no longer confined to shopping because ladies of the night worked in the 'colonnades'.